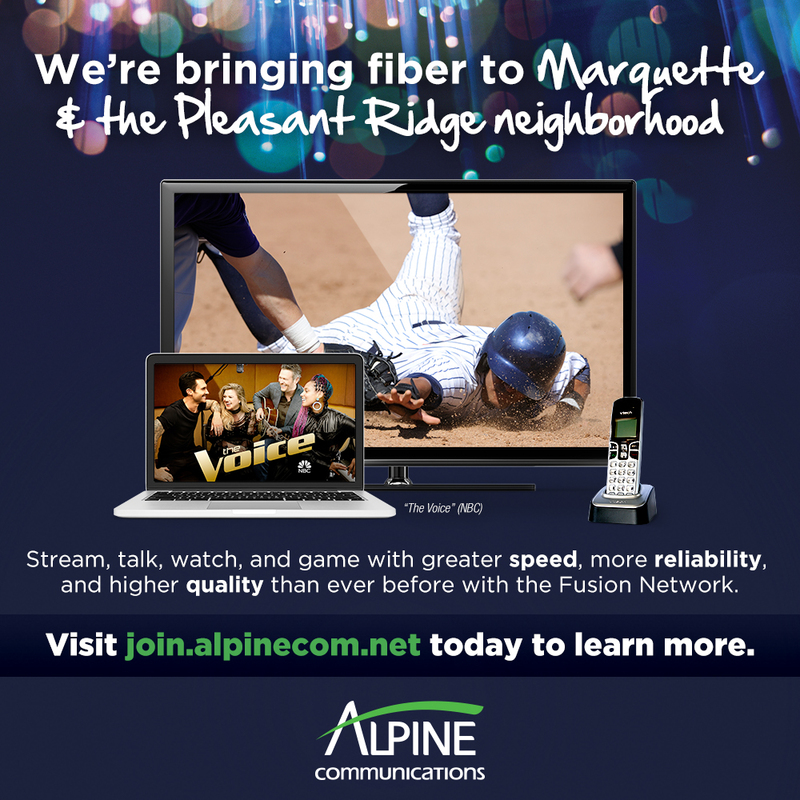 Alpine Communications is pleased to announce that we will be making a major investment in a state-of-the-art network that will provide a 100% fiber-optic connection to businesses and households in Marquette and the Pleasant Ridge neighborhood. Besides providing high levels of reliability and sound quality, the Fusion Network will allow us to deliver ultra-fast internet service while ensuring that we’ll be able to offer whatever exciting services the future brings. We are making this investment because we believe it will contribute to the economic vitality of the area and allow us to serve this great place we call home with the best communications network available today. Homes and business will benefit from the 100% fiber-optic Fusion Network. We will be upgrading the city of Marquette and the Pleasant Ridge neighborhood to fiber optics. Construction on the fiber-optic Fusion Network will begin in May and is scheduled to continue through the summer. To prepare for the start of construction, Alpine field technicians will be visiting your home and/or business within the next few weeks to discuss the project with you in further detail. They will work with you to determine the appropriate place to install a new Optical Network Terminal (ONT) on your home to replace the existing box. Our technicians will also want to talk to you about what underground wiring, piping, etc. exists on your property. All Alpine technicians will be wearing company shirts and have company identification on them. Please review this FAQ sheet , register at join.alpinecom.net, or call us at 563-245-4000 with questions.